It may come as no surprise that I love the alien franchise. I watched the first one with my dad when I was probably too young (a common story amongst my peers) and I loved the second one as well. Since then its all got a bit... silly. Its got to the point where every new Alien movie makes me feel like Paris Hilton's parents must do every time she's on TV; a mixture of shame and anger at what the mass media is doing to their baby. 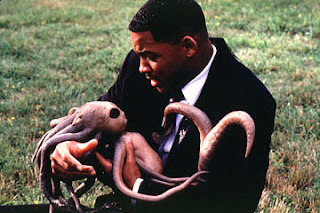 Imagine my exitement then when I heard none other than Ridley Scott was making a new Alien movie (with James Cameron!) Then Fox Foxed it in the Foxing face with its big Foxing Fox stick (made of Fox) and we got AVP after Cameron and Scott dropped it. On its head. Into a bath full of stupid. Luckily though this month we were treated to Prometheus, a film that was originally set to be a gritty reboot of the Alien franchise when it started production back in 2009 (because gritty reboots are the new sequel) but turned out to be something different. You see Prometheus isn't really an Alien movie at all. It takes place within the Alien universe (the far future of mankind in which megacorp Weyland Yutani control everything) but it contains no Xenomorphs. I am however, OK with that. It seems like we can't make decent Alien movies any-more; hell all we needed to do was directly base the AVP movie on the original Alien Vs Predator comic series from the late 80s and it would have rocked. Another hot tip would have been to actually use Joss Wheadon's script for Alien Resurrection as opposed to letting the editor tear it up and film whatever he liked. Alas, it seems film makers loose all ability to think straight as soon as the eponymous phallic beastie turns up so maybe he needs a break. It would appear however that Prometheus is a spiritual successor to the alien franchise; it keeps a lot of the biomechanical Geiger aesthetics that made the Derelict from Alien so compelling and the malign presence of WY that permeates the confines of the Prometheus - personified by the too precise to be human David (a brilliant Michael Fassbender) - makes the film both familiar and new at the same time. When monsters do start popping out of the woodwork we get another taste of the familiar (acid for blood, Freudian nightmares) but we're not dealing with the same creatures here; what was black and chitinous is now pallid white and sinuous, all tentacles and sucking mouthparts, Prometheus's monsters have more in common with deep sea scavengers than insects and this is an interesting new direction. A common Hagfish. Sleep Tight! The plot of Prometheus is also more ambitious than any of its predecessors' and centres around the Engineers (the supposed creators of mankind), mastery over life and death, the hubris of science and squid babies. This message gets a bit garbled during the third act but it still makes for good science fiction storytelling which kept me interested from beginning to end. As far as set pieces go we're dealing with a much more epic and far less claustrophobic movie than one might expect and there's nothing here like the gradually tightening tension of Alien or the taught scenes that marked the last half hour of Aliens. Everything is a lot more fast paced and loud. It's a shame really as no amount of special effects or deep sea hellspawn can be scary unless given proper time to creep up on you. It's probably symptomatic of Prometheus being Fox's big summer hope of 2012 but the crash bang wallop style of later scenes of the movie kind of undermine any real sense of dread that could have soaked everything with it's writhing puckered malice. In a nutshell Prometheus marks the start of what is hopefully a bold new direction for the Alien universe. It's good to see a dark, high concept, mystery filled epic science fiction movie in a marketplace crowded with reboots and rehashes of older movies, even if it does plant its roots in well tilled earth. The Xenomorph was fun for a while but a king has his reign then he dies, such is the way of things.